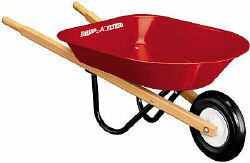 The Radio Flyer mini wheelbarrow strong enough to work like a real tool. It's the ideal "help mom and dad" action toy. Body: 20" x 16" x 4"
Wheel: 7" x 1 1/4"
Gift Buyers: This item ships in it's factory box. The outside of the box states the contents.